It’s that time of the week again, and I’d like to give you some pointers on how to use haddock. You might have seen the orange tinted fish in the freezer section of your supermarket, but that’s not all there is to haddock. In South Africa, haddock is hake that has been smoked, which gives it a lovely woodsy flavour. The orange colour you see on the frozen store-bought fish is a dye. Naturally, haddock only gets a very light colour from the smoking. We have acquired a regular supply of haddock, so here are some recipes to give you inspiration! Kedgeree is an Anglo-Indian breakfast dish, which is equally good as a lunch or dinner. It is thought that when the English were in India, their cooks and housekeepers knew about the English tradition of smoked kippers and eggs with breakfast, however in India, rice and haddock was more widely available, and so kedgeree was born – an English-Indian hybrid, that is universally satisfying. 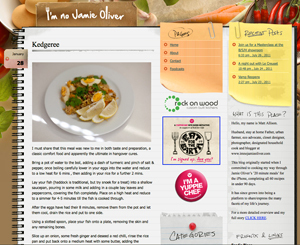 Check out Matt’s version on his blog, I’m No Jamie Oliver. There’s nothing quite as satisfying as a pie in the colder months, and while we are heading towards summer now, the nights are still chilly, and something is definitely needed to keep the cold at bay. 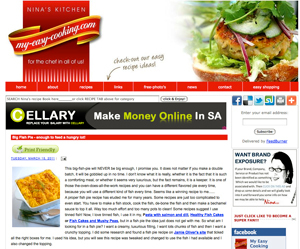 A hearty, easy fish pie is definitely the way to go, and Nina’s is as hearty and easy as they come. Using a combination of fish, she suggests smoked haddock as an ingredient to up the smokey tastiness of the pie. Topped with a cheesy mashed potato topping, this pie is extremely delicious and does its job of keeping the cold at bay! 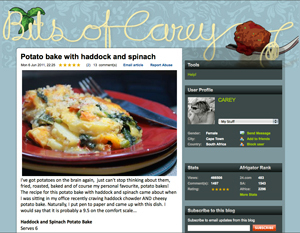 Another deliciously satisfying comfort dish is potato bake. With layers of potato, cream and cheese, you can hardly go wrong, but add in delicious haddock and spinach, and you’re in for a winner. This amped-up potato bake is a delicious meal in itself, freeing you up to curl up on the couch while it bakes in the oven. Enjoy! Looking for something a bit lighter to enjoy on the warmer evenings? 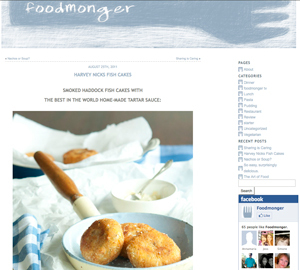 Theses fish cakes from the Foodmonger are deceptively delicious. A mixture of bechamel and fish covered by the crispy coating makes these fish cakes very moreish. These are nicknamed ‘Harvey Nicks Fishcakes’, as the recipe comes from a chef who worked in a restaurant at Harvey Nichols in London. Well, there you have it, authentic English fish cakes, with a recipe for the best tartare sauce you’ll ever eat too, if the reviews are to be believed!